Specialist engineering firm, Lincoln Precision Engineering, are investing about £2.5 million in an exciting relocation move, which will pave the way for new jobs. The company, which specialises in laser-cutting, computerised machining and folding is spending £1.5m on a move to purpose-built premises on a new business park, where it will also install new laser and folding equipment. Established 30 years ago, LPE supplies a diverse range of industry sectors nationwide will be making the switch to their new site in early 2018. 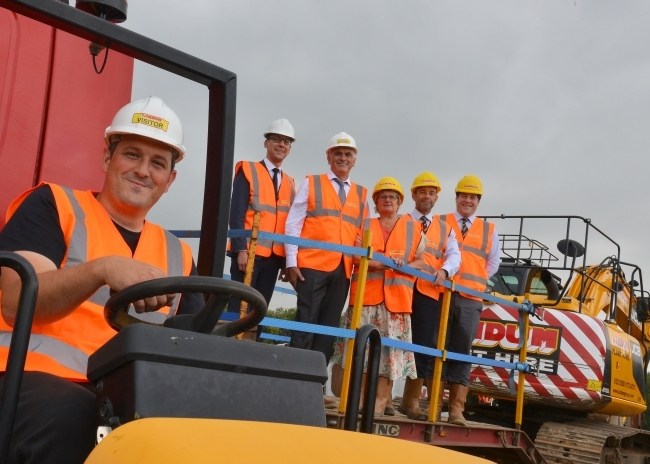 The Lindum Group revealed it had sold LPE land at the seven-acre park – which could ultimately attract up to 200 jobs to the area – and has designed the company’s bespoke premises, ahead of starting work on site immediately. Commercial agent for Discovery Park Banks Long & Co said the land holds great promise for further jobs for the local economy and it congratulated LPE on being the first to snap-up space at the site. North Kesteven District Council has also welcomed news that local firm LPE is the first company to be moving into Discovery Park. LPE Managing Director Trevor Wherrell said: “During our time at the Lindum Business Park, we have grown into a company with a turnover of nearly £2.5 million. Our plans for further growth and the opportunities offered by the diverse sectors we deal with, has encouraged us to invest in our own premises. LPE is a supplier to a wide range of industries, including those working within the construction, motorsport, energy and agriculture sectors. “Whilst our move represents an investment of about £1.5 million, we are also buying new laser-cutting and folding equipment costing a further £1 million, for our “around the clock” operation, and we hope to create around six more jobs within 18 months of relocating,” said Mr Wherrell. Lindum Group Development Surveyor Dean Bower said: “We are delighted to provide a design-and-build solution at Discovery Park for Lincoln Precision Engineering, a family-run company which has grown its business whilst being based on our nearby Business Park on Station Road. “The 16,200 sq ft office and production facility being created for LPE will take 1.2 acres of the seven acre site, allowing us still to be able to offer other businesses bespoke premises solutions here, on competitive freehold or leasehold terms. Banks Long & Co Director William Wall said: “Discovery Park lies in the fast-growing LN6 area, which is superbly located for quick access to the A46, A1 and wider East Midlands. “We are delighted to see a homegrown engineering firm being the first to take space on the site, which offers superb opportunities for local, regional and national companies.